The first interactive bench in the world invites you to play, move and experience the urban space in a new way. 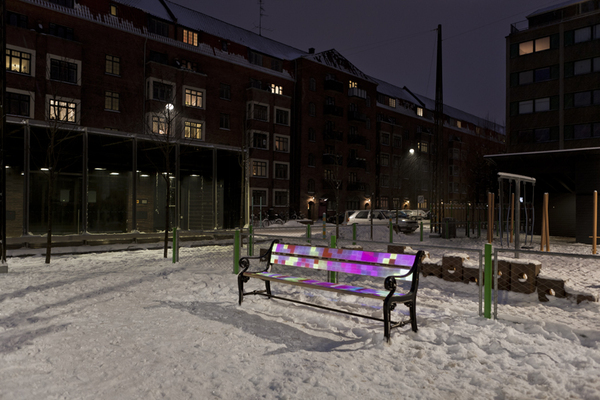 This Playful Bench that changes colors and patterns as you pass by, has sprung up in the middle of Copenhagen’s ‘Islands Brygge’. 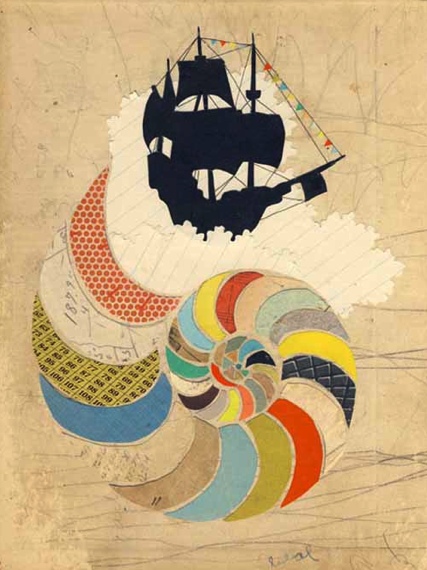 Hollie Chastain is a full-time found paper and collage artist in Chattanooga, Tennessee. A creative spirit ,with early interest in art led to dabbling in watercolor, pottery, glass and earned her a degree in fine arts. Influenced by nature and fairy tales, she lets water stains, scribble and natural aging play into her pieces. The subject of the piece is often influenced by the materials as opposed to building around a sketch or idea. She creates a world of adventure and secrets open for the viewer’s interpretation. The spot features a pint-sized Darth Vader who uses the Force when he discovers the all-new 2012 Volkswagen Passat in the driveway. It leverages humor and the unforgettable Star Wars™ score to create an emotional commercial. The Rite is the 21st century answer to the film The Exorcist. Playing upon themes of god, the devil and religious beliefs, it steps much further into the realm of faith than The Exorcist did, with less scares. 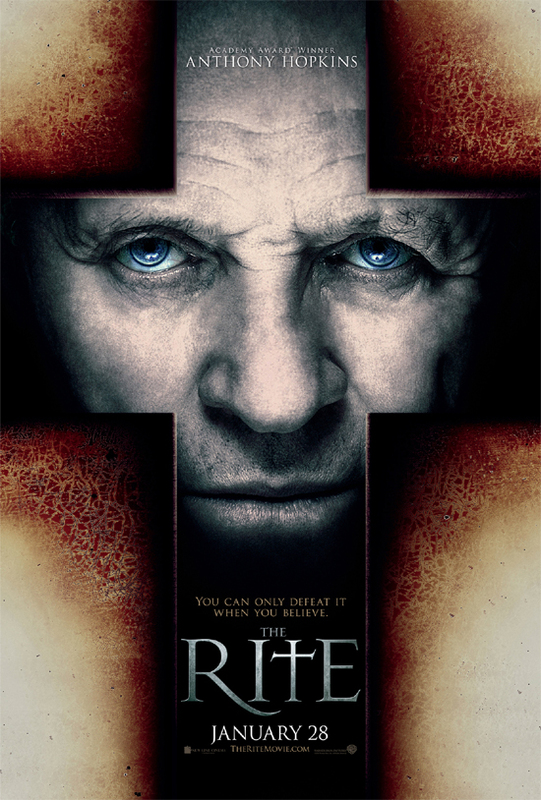 Directed by Mikael Håfström, The Rite, which is inspired by true events, stars Anthony Hopkins as Father Lucas Trevant whose unexpected techniques in performing exorcisms, draws Michael Kovak, (played by Colin O’Donoghue, last seen in the Tudors), into a world he’s had little belief in. The world of faith. Michael Kovak is the son of a mortician. (Yes, Michael the Archangel. How can we miss that one?) Throughout his life he has battled with faith. Instead of joining his father (played by Rutger Hauer) in the embalming-the-dead business, he decides to go away to seminary school. As his courses are winding down to an end, his plan is to finish but not become a priest. This doesn’t go over too well with Father Mathew (Toby Jones), a teacher at the seminary school who sees much potential in Michael. With a little push and the ultimatum of taking away his scholarship, forcing him to pay for all his schooling, Michael ships off to Vatican City in Rome to learn about exorcisms. When Michael visits Father Lucas, and witnesses a ‘supposed’ exorcism for the first time, he is none too impressed. As a psychology major, he believes it all comes from within the afflicted and has nothing to do with the devil. Little by little the armor of disbelief that Michael wears is chipped away by everything he witnesses and his faith is ultimately put to the test in ways he’s never imagined. Angeline (Alice Braga), a journalist seeking answers about the supernatural, meets Michael in class and her supporting role (literally) plays out towards the end of the film, as she acts as Michael’s crutch, when all he wants to do is fall. There are many creepy moments in The Rite, via hallucinations and flashbacks that haunt Michael. It is a psychological thriller that plays upon what we all have tried to figure out our entire lives. Is there truth in ‘believing’? Does faith really have an impact? Are there demons? This unique piece of prehistoric jewelry is inspired by the dinosaur at London’s Natural History Museum. 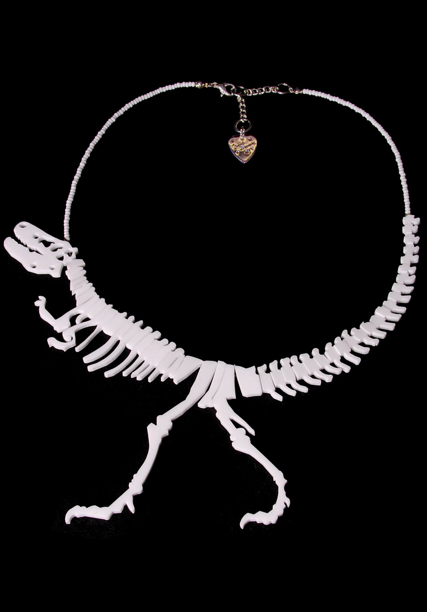 The fifty boned necklace which makes up the dinosaur’s body, hangs from a hand-beaded strand of seed beads. The necklace is reversible, so you can wear it facing either way. Learn about the dinosaurs at London’s Natural History Museum here. Necklace available at Tatty Divine. 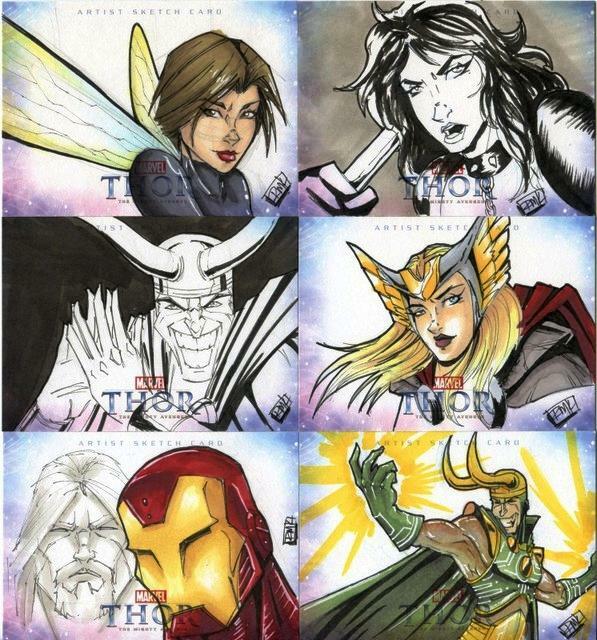 These illustrated gems are part of the Upper Deck’s Thor movie trading card set, where original art sketches by Ryan M. Kincaid will randomly be inserted in the packs (less than one per box). If you collect trading cards you will have the opportunity to find one of these gems in your deck, including a four-card puzzle. 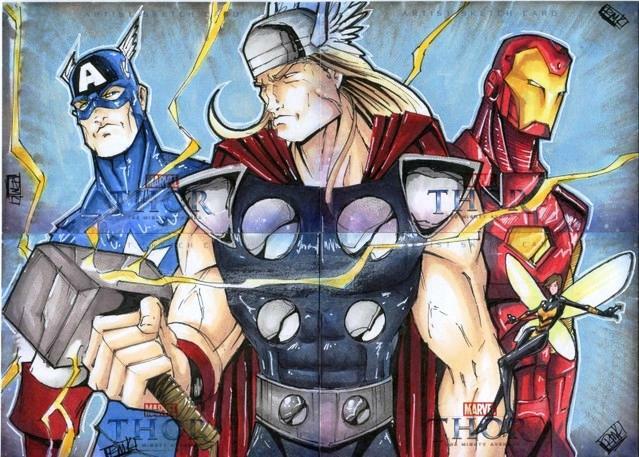 Thor will be coming to a theater near you on May 6, 2011. 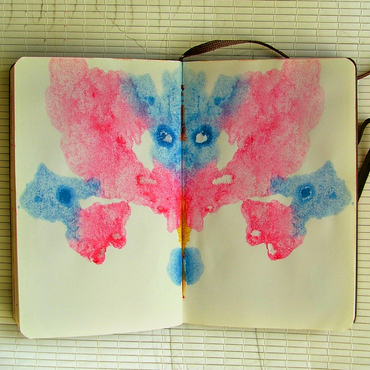 What do you get when you mix pressed paint together (as seen in the style of the famous Rorschach test) with illustration? 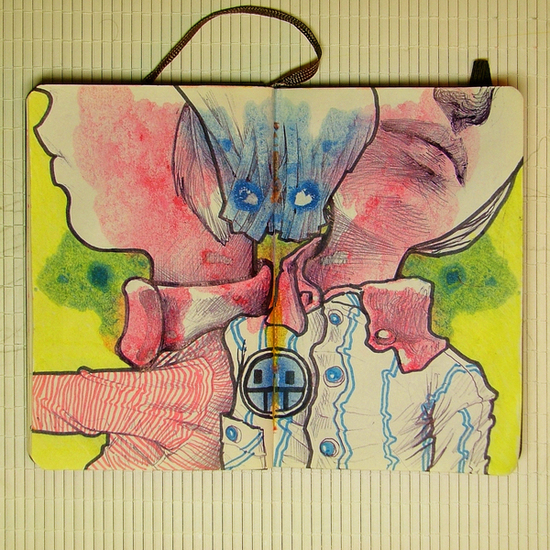 The ‘See Saw’ series by Portuguese artist L Filipe dos Santos.